Your mom was right…mind your OWN business. Remember when you were a little kid and your litany of excuses to get what you wanted included things like…”but Jenny has one” or “but John’s mom lets him do it” or – classic – “every single kid in school owns one but me”…? Your mom’s response was likely some variation of: Don’t worry so much about what Jenny is doing…worry about what YOU’RE doing. Sage advice, mom, and after you repeated it a zillion times during our childhood, most of us embraced at least some part of this philosophy. But apparently, not the folks who handle the advertising for Tasti D-Lite. Pinkberry should send Tasti D-Lite a thank-you note for this ad. 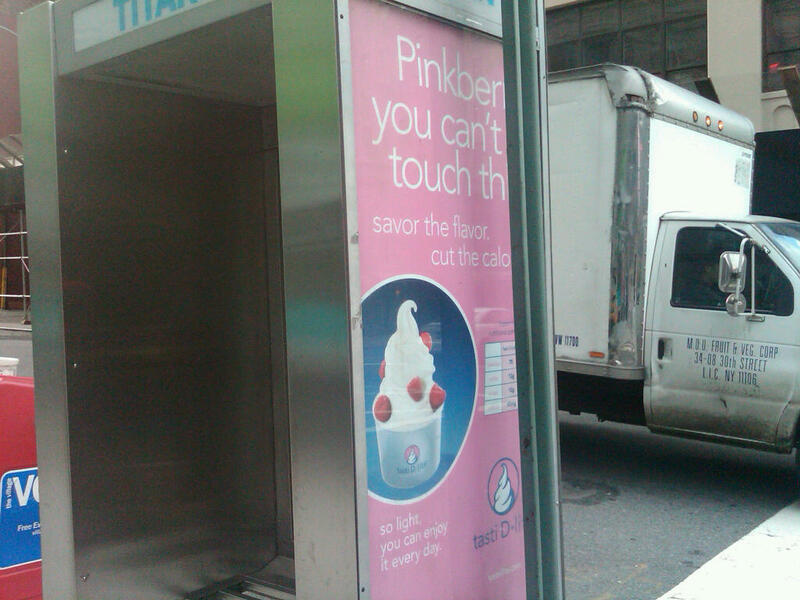 I’ve walked past this ad on Varick Street at least a dozen times now, and damn if I didn’t think it was an ad for Pinkberry, the yummy frozen yogurt company. But while waiting to cross the street this morning, I actually read it, and was startled to realize it’s really an ad for Tasti D-Lite, one of Pinkberry’s competitors. Click on the image to enlarge it and you’ll see what I mean. Let’s ignore for the moment the fact that this ad is obscured by the pole from a street sign. What’s more damaging is that the very first, and biggest, word in the ad is “Pinkberry.” And the logo for Tasti D-Lite is a teeny-tiny thing on the lower right hand corner (right behind the pole, actually…brilliant). The lesson here is simple. Don’t spend your money advertising your competitor’s brand. Even including a small mention of them helps raise their brand awareness…and in fact, you could actually be introducing them to consumers who had previously never heard of them. So the next time you’re tempted to call out one of your competitors in your marketing efforts, just pick up the phone and call your mom for the “don’t worry about what THEY’RE doing…worry about what YOU’RE doing” lecture. Even when it comes to advertising…on this point, Mother Really Does Know Best. And to all the moms out there…especially our own… the gang here at Redpoint wishes you a very happy mother’s day and a grateful THANKS for all you’ve taught us over the years!